Ok, I'll schedule a battle for zone 38 after that. On Saturday, I'd prefer to end them before 21:00 UTC. If you want them on Sunday, they'll have to end before 19:30 UTC. They don't have to happen on the same day. saturdays are preferable to me (not that it matters because i won't be battling unless someone else joins darvince's team or something, but being able to spectate would be nice, and i don't mean spectating through a youtube video). All battles involving Sequoia Front have been cancelled because it was disbanded. Red Front claims zone 38. Rest of Sequoia Front's flags have been removed. The Lenin Front attacks and claims Zone 42 from The Blue Front. There were some issues in this battle. First of all, I forgot to start the clock when I began the battle, so I only turned it on after a few minutes. This means that the time left that I announced was off from the time that was meant to be left. We also had a scheduled restart that delayed us by 25 seconds. Taking this into account, the flag of The Lenin Front burned down 30 minutes and 50 seconds after the battle start was announced. 7 seconds later, although not in the exact same location as the old flag, but still connected to the flagpole, TMC did manage to make a 2x2 blue flag. Both teams should have beds in their zones, so that they will spawn inside their zones if they die. In other words, you have to spawn within a zone your team owns during the battle, so sleeping in the enemy bed was breaking the rules. The flagpoles in the region must not be taller than 20 meters from the ground, and the flag blocks may not exist outside y = 65 to y = 130. Additionally, sunlight must be able to reach the top of the flag. I understand that Fiah didn't have time to check these rules when the battle was scheduled in 15 minutes, however I still think the rule can be considered in effect and thus violated. I have checked the flag, and it was around y = 96, which is 32m above the water surface. Because of this, I have decided to declare The Blue Front winner of the battle. The Blue Front has successfully defended Zone 30 against The Lenin Front in a fight between Bla, Blotz vs Fiah and Darvince. The base of The Blue Front is now Zone 35. Battle 7: The Lenin Front (Fiah, Bla) in Zone 39 warded off an attack from The Blue Front (Blotz, Mudkipz, Thomas) in Zone 35. Battle 8: The Lenin Front (Fiah, Bla) counterattacked against Zone 35 from Zone 28, and conquered the zone from The Blue Front (Blotz, Mudkipz, Thomas). 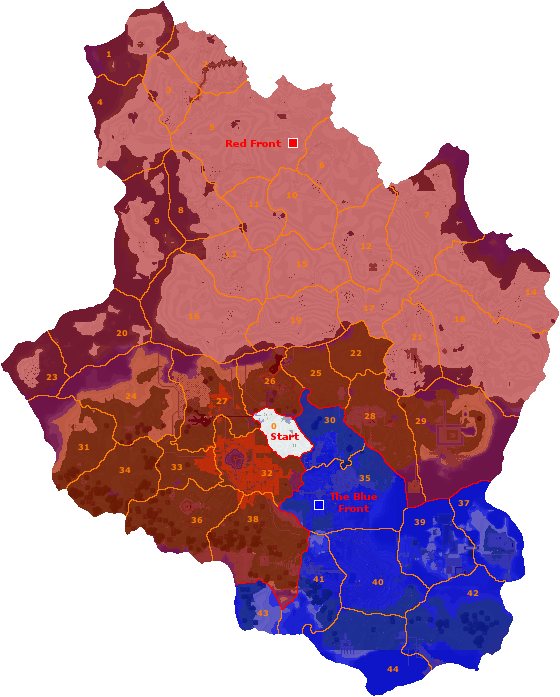 Since this was the base zone of The Blue Front, The Lenin Front gains all the current zones of The Blue Front. Battle 9: The Red Front (Bla, Mudkipz, Ventus) attacked and conquered Zone 29 from The Lenin Front (Fiah, Blotz, Thomas). Since this was the base zone of The Lenin Front, The Red Front gains all the zones in the Battleground. As a result, the new BG map looks like this. Battle 10: The Blue Front (Lotzubutt, Darvince and Fiahstorm) attacked Zone 21, defended by Red Front (Blanoxium, Mudkipz and Ventus). Red Front successfully defended the zone. Battle 11: The Blue Front (Lotzubutt, Thomas13542) attacked Zone 21, defended by Red Front (Blanoxium, Fiahstorm). Red Front successfully defended the zone. Battle 12: Red Front (Blanoxium, Mudkipz, Soccerboy, Smjjames) from Zone 38 attacked Zone 41, defended by The Blue Front (Lotzubutt, TheMooCows, Yqt1001). The Blue Front successfully defended the zone. Battle 13: The Blue Front (TheMooCows, Yqt1001) from Zone 0 attacked Zone 26, defended by Red Front (Blanoxium, Ventus). Red Front successfully defended the zone. Battle 14: Revolutean Front (Fiahstorm, Matty406) from Zone 0 attacked Zone 27, defended by Red Front (Blanoxium, Ventus). They replaced the flag, but the victory is disputed. They used an obsidian skypillar just below flag height from the Start zone, but it went through Zone 32 owned by Red Front. As it is against the rules to interact with blocks in other zones and their victory relied on it, I'm considering if the victory should be revoked. I think making exceptions is a bad idea - if you're in doubt, stay safe or check the borders on the map before the battle. remove the offending blocks and resume the battle with the amount of time left. Due to the fact that the zones are weirdly shaped (it'd be more fair if all zones were more smooth) I think I should get it. I mean, it was REALLY close. And If I were to have made a bend northwards 1-2 blocks it would have had little to no effect on my victory. I inspected the area and found that the border which Bla claimed was clearly visible is not in fact clearly visible, so I think it should be given to Fiah. Although I do like kip's idea. In fact? How do you determine this 'fact'? 'Clearly' is a subjective word. I think it was clearly visible because it follows the terrain, as it follows the side of a cliff. Had this been a battle at ground level, you would know one side was another zone, and the other side was the zone. It's not my problem if people make a sky bridge but don't check that the sky bridge is inside the zone. However, over the past days, I've become convinced that The Battleground needs some serious rule changes, because the battles are really not meant to be fought on sky bridges, but at ground level, and the bases are not meant to be so overpowered like in the battle with TMC and Yqt, that the attackers have virtually no chance to get into it. (However, I think spending 4 hours or more on defenses, should pay off by not giving a plain 50/50% chance of losing it in just one 20 minute battle, but the attackers should still have a better chance than what Yqt and TMC had, and if the zone they attacked gets attacked, I will downgrade the base before the battle, at the very least by moving defense spawn to ground level). The zones were originally drawn so they followed terrain features, like cliffs. Smooth borders might be easier to imagine geometrically, but be harder to recognize from terrain features. Anyway, I won't change the borders now, as too many things rely on them now, sorry. I think you could've looked at the map before battle so you could know the shape of the zone. It was clear from your chat messages long before the battle that you weren't going to deal with the ground defenses, so I suppose you had plenty of time to check if your straight line skybridge would intersect with the other zone while planning. I've decided to revoke the victory and that Red Front will keep the zone. However, I'll let Fiah have a rematch for the zone if he desires, without Red Front improving the defenses/changing blocks there before the battle, except that the skybridge will be removed and the battle will be fought according to new rules banning skybridges. I haven't written out the new rules yet, only a rough sketch for its elements, so the defenses may be downgraded if the new rules make ristrictions on it, but they will not be improved. 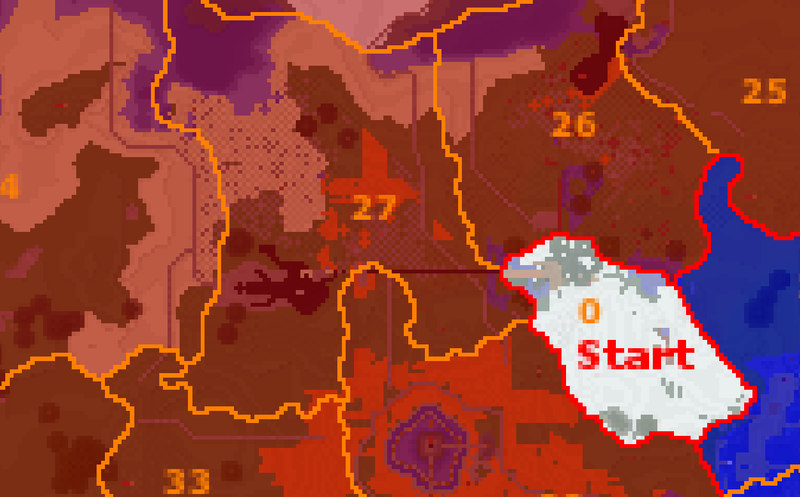 Nahh, that zone is pretty much a fortress and I don't think I could conquer it ground-way. As far as rules for defenses go, I think banning all obsidian is all you really need to do. Banning lava and water would reduce the lag, which is obviously a problem, but I'm not sure how big of a difference it would make. Fair enough, it's worth considering, but I suggest watching some of our older BG battles for obsidian bases. Didn't they seem fair enough? I've spent probably 1+ day gathering all the obsidian and constructing the obsidian towers, so I'm not very fond of going ahead to ban obsidian immediately, when we've also seen that battles for obsidian bases can be fair. With the new rule changes, I think we should try another game and see what happens. Battle 15: Red Front (Bla, Komrage, Ventus) from Zone 25 attacked Zone 28, defended by The Blue Front (Blotz, TheMooCows, Tuto). Red Front successfully conquered the zone. Battle 16: Revolutean Front (Fiahstorm, Blotz) from Zone 26 attacked Zone 16, defended by Red Front (Bla, Komrage). Revolutean Front successfully conquered the zone.